(Merced, CA) - The Ride XTi is as versatile as it is pocketbook-friendly. The 21-foot Ride XTi gives boaters the comfort of wrap-around lounge seating with the performance and economy of a fuel-injected 320 horse power direct-drive engine. To top it off all of this multi-purpose utility is fitted perfectly into one of the industry's most respected wake-making hulls and offered at a price normally reserved for one-dimensional tow boats. Ride Series boats share the same SV23 Wake Hull that has been propelling professional wakeboarders to record heights for years. That experience is enhanced by 500 pounds of center Malibu Launch System (MLS) and the Malibu Illusion X wakeboard tower, standard. For 2006, the Illusion X has been redesigned with a molded-in navigation light and a Quick Pin breakdown feature that allows the tower to be raised and lowered with minimal resistance. Also new for '06 is Malibu's Precision Pro Speed Control. Now standard on every Malibu model, Precision Pro Speed Control is all you need to shred the wake at a steady pace. The optional wake-building Wedge or the New Power Wedge can be added to the Ride XTi to size and shape wakes to order. The traditional Wedge uses hydrofoil technology to simulate approximately 1000 pounds of down-froce. The New Power Wedge also increases wake size but, more importantly, it allows riders to customize wake shape to accommodate various styles and abilities. A switch on the dash offers a range of five settings, for 400 lbs. to 1200 lbs. of displacement and a separate cockpit gauge pinpoints the exact Wedge location for rider preferences. 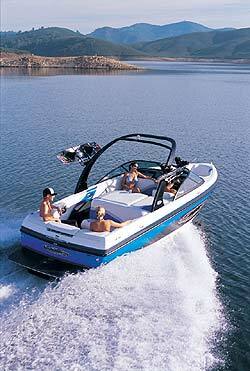 Handling and drivability are signature Malibu Boats assets and the Ride Series is no exception. Rack and pinion steering, zero-friction throttle cables, an adjustable rudder and a CNC machined prop all play a part in Malibu's Instantaneous Response Technology (IRT). The combination of these features promotes finger-tip control and superb handling, with a rider or without. Along with physical control, Malibu gives the driver piece of mind information at a glance in the cockpit area. The Ride XTi along with every other model in the Malibu line-up hosts the new LCD Graphical Dash Display encircled by a chromed Billet Dash Insert. This information center spreads the word on speed control, time, air/water temperature, speed, rpm, oil pressure, voltage, engine hours, and the list goes on. The Malibu Ride XTi is built using the same proven production innovations that have led Malibu boats to 12 Tow Boat of the Year awards. The Ride XTi benefits from all-fiberglass construction strengthened with multiple layers hand-laid bi-directional, tri-directional and quad-directional fiberglass. This extremely strong and light weight exterior surrounds Malibu's patented Fiberglass Engine Chassis System (FibECS) which adds a rigid back bone to the boat and allows the engine to be through-bolted to the boat's core. Connected at eight separate attachment points, the engine is perfectly balanced for peek performance and a vibration-free ride. Add the stout Space Composite Flooring System and Ride XTi passengers will experience a comfortably quiet ride that is comparable to a Luxury Sport-V. The Ride XTi motors off the factory floor with the power of 320 horses galloping through its core, reinged in by a new Electronic Throttle Control (ETC) system. With 375 foot-pounds of torque, its brain is the latest Delphi ECM (engine computer module) running the latest software, all custom-calibrated by Indmar. The 320 LCR engine is programmed to deliver the power band riders want, plus the classic turn-key starts, unhesitating dependability and fuel efficiency that only Indmar's MPI can deliver. This engine offers Vortec's high-flow cylinder heads with straighter intake ports for more power, and roller valve lifters for reduced friction and improved performance. Like all Indmar engines, it is built for the long run. The look of any Ride Series model can be customized to speak to the true nature of each owner. Twenty-one vibrant gel coat colors are available to paint the exterior and the perfectly color-matched 38oz G&T Marine Vinyl equivalents decorate the interior. New Ride Series vinyl decals brand theRide XTi for gawkers, while the chromed billet aluminum interior emblems remind passengers that they are sitting in a Malibu. Ride Series interiors are stuffed with tri-ply interior foam providing 3 different densities of padding for maximum comfort and bounce-back then covered in 38 oz. G&T Marine Vinyl for the plush feel that Malibu is known for. Large 5-inch seat bolsters offer passenger's incrediable leg and back support while the driver gets all of that and more with adjustable automotive-style lumbar support. The Ride Series is certified by the National Marine Manufacturers Association (NMMA) for safety and covered under Malibu's Limited Lifetime Transferable Warranty. The Ride Series ownership experience delivers performance as well as peace of mind. Only a wallet will know the difference between the Malibu Ride Series and higher priced models. No matter where it rings out on the cash register, Malibu stands behind every model they make. 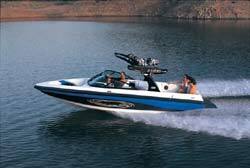 Visit your nearest Malibu Boats dealer for more information on the Ride Series as well as the seventeen other models Malibu is building for 2006.